Writing a script by simply using the javadoc can be painful, or if you code is complex and logging statements are not enough you may feel the need for a symbolic debugger. 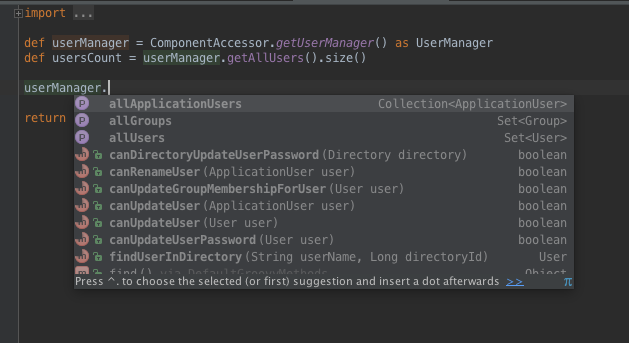 Here are some instructions for setting up your application and Intellij IDEA 14 with Groovy. 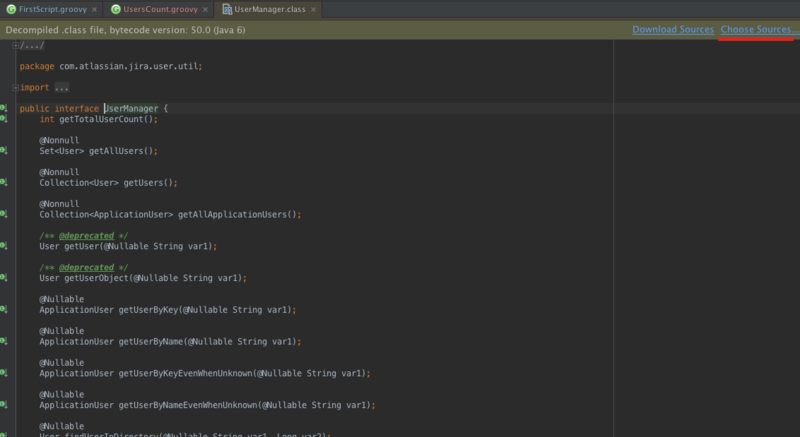 Want to benefit from IDE features such as code autocompletion and syntax checks. Want to have quick access to the Atlassian API’s. Are tired of checking the application logs in search of failures in their scripts. Want to keep scripts in a centralized place. Want to be as efficient as possible when writing groovy scripts. Once you have the project in your workstation, open IntelliJ IDEA and import it by going to File > Open > and then selecting the pom.xml file. Click on File > Project Structure > SDKs (Platform Settings). 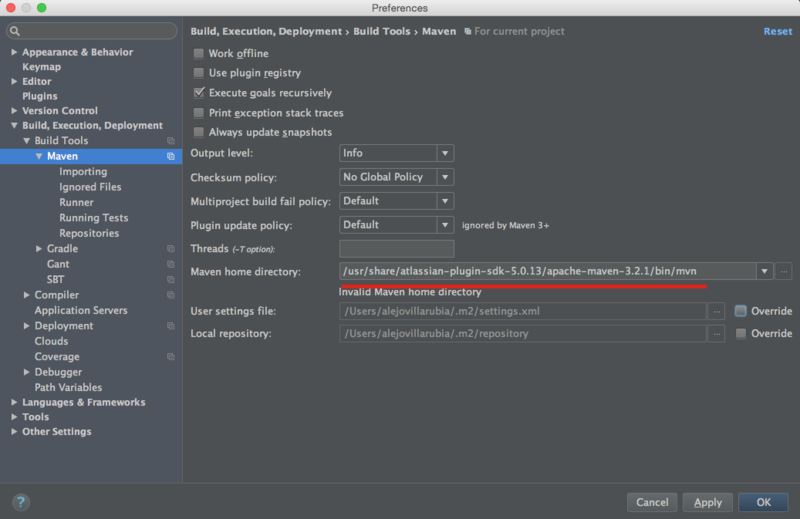 Copy the path to your maven installation (you can see it underlined in the image). After completing the former steps, those maven dependencies (in the pom.xml file) that where showing up in red should now appear as resolved. If they still show up in red, right click on the Project name > select Maven > click Reimport > wait a short while until IDEA downloads the dependencies. Besides the fact that we want to be able to write scripts with the help of an IDE, we will probably like to be able to debug them too. 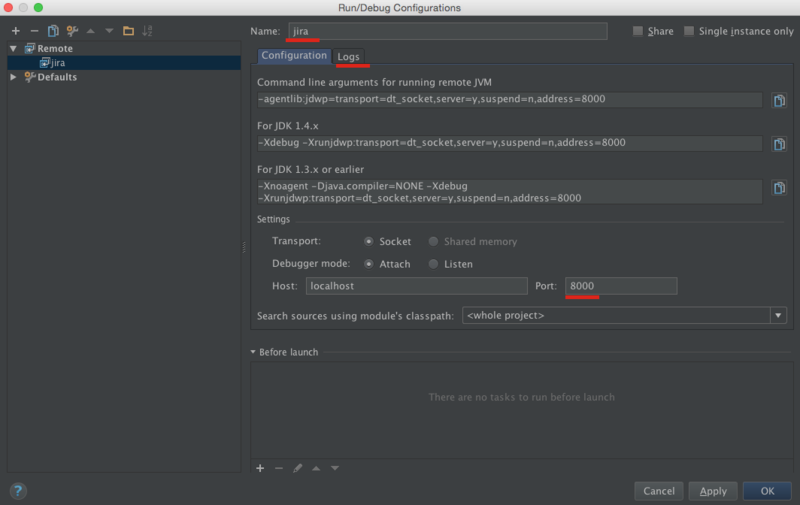 Read this section to learn how to configure a new or an existing instance to be debuggable. If you have a testing instance that you want to use to debug your script, you will need to add some instructions to it in order to open a debug port and set logging levels for the ScriptRunner add-on before starting the application. PATH_TO_PROJECT: In the first part of this tutorial you cloned a repository using git clone. You will need to substitute PATH_TO_PROJECT with the path to that directory (i.e. /Users/scriptrunneruser/repo/scripts-repository). Be aware that those lines will not work in Windows, where you will need to modify the setenv.bat file instead. Start the application which now has a debug port opened and debug log levels set for ScriptRunner! atlas-run-standalone --product APPLICATION --version VERSION --jvmargs "-Dplugin.script.roots=PATH_TO_CLONED_PROJECT/src/main/resources/ -DdisableJiraEmail=false -Xdebug -Xrunjdwp:transport=dt_socket,address=8000,server=y,suspend=n"
APPLICATION: Is the name of the application that you want to start. Substitute APPLICATION with jira to start a new instance of jira. If you want to create a new bitbucket application, use bitbucket instead. VERSION: Version of the application you want to start. The version 6.4.7 is a valid one for Jira. That command will create a new folder called "amps-standalone" that contains a new jira application installed and ready to be used. Terminate the execution of the application by pressing CTRL+D or CTRL+C in the terminal window where you run the atlas-run-standalone command previously. Run the atlas-run-standalone command from the first point again. It needs to be called from the folder where you called it the first time you run it. If you call it from a different location, it will create a new jira instance. Set the debug port to 8000. When using an existing instance, it would be something like this: PATH_TO_HOME_DIRECTORY/log/atlassian-jira.log. When using the atlas-run-standalone option, you will find them somewhere like this: …​/amps-standalone/target/jira/home/log/atlassian-jira.log. In IDEA Open the file FirstScript.groovy. Add a breakpoint in the second line. Click on the File tab and write the name of your script (FirstScript.groovy). The debugger should stop the execution of the script in the breakpoint that you just set. 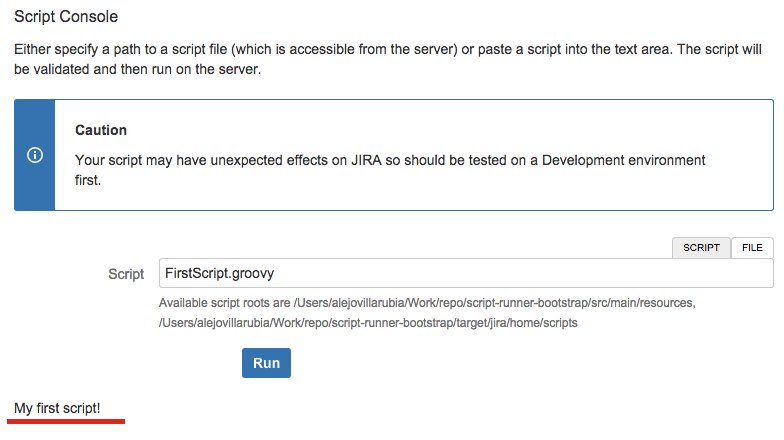 If you click on the atlassian-jira.log tab from the debug area, you will see one log message. Go to the Jira Administration page > Script Console. Imagine you want to want to do something else related to users but you don’t know what is the UserManager class able to do. Somewhere in the file, type userManager. and you will see the properties and methods available to be used. This is one of the biggest advantages of using IDEA. If you click the Choose Sources link and select the folder that contains the application source, your class will then be fully resolved. After all the previous steps you have set up an environment to write your Groovy scripts easily. There is no need to repeat all the steps anymore, so the next time you want to create and debug a new script, you will just need to add a new Groovy script to your IDEA project and start the debugger to test it.